Broken capillaries and other visible vascular structures will be gently eliminated from the upper layers of your skin surface. The light energy of the therapy is absorbed by the oxyhemoglobin resulting in heating of the blood vessels. With the correct wavelengths and fluence, the vascular lesion will be heated to above 70 oC. At that temperature, blood vessels will break down and shrink which leads to a reduction of the vascular lesion. 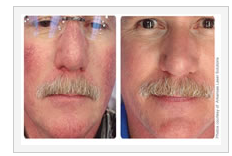 With proper treatment, the procedure will lead to the reduction of Rosacea and improved skin appearance in most clients. If you suffer from Rosacea, or other vascular and pigmentation problems, take the first step on your path to wellness and contact us for a FREE skin analysis and consultation.